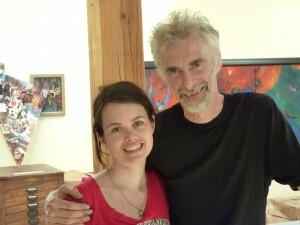 Here I am with THE Nick Bantock in the Forgetting Room, Salt Spring Island, BC, July 2010. Art equals Life. Life equals Art. It is from this concept that my creative practice grows and thrives. For me being creative is like breath. Something I can not live with out, a reflexive action that propels me forward. An earnest exploration of my inner and outer worlds: my individuality, my identity, my uniqueness — a quest for self. Complexities are my specialty. I like the light. I like the dark. I’m part Canadian, part New Yorker. I like things neat and tidy, yet I’m not afraid of the mess. I like a healthy dose of charisma and passion in my serenity. I also like party hats and work boots. Like the world outside, my creative pursuits reflect dynamic combinations – complexities enhance and enrich my life, my art. My process is very intuitive, relying on no particular media/medium. Sometimes the work includes collage and paint, other times it is strictly digital, or it could be anything in between. Diverse training in printmaking, design, metal smithing, painting, papermaking, installation, video and performance art guide my mark making process.